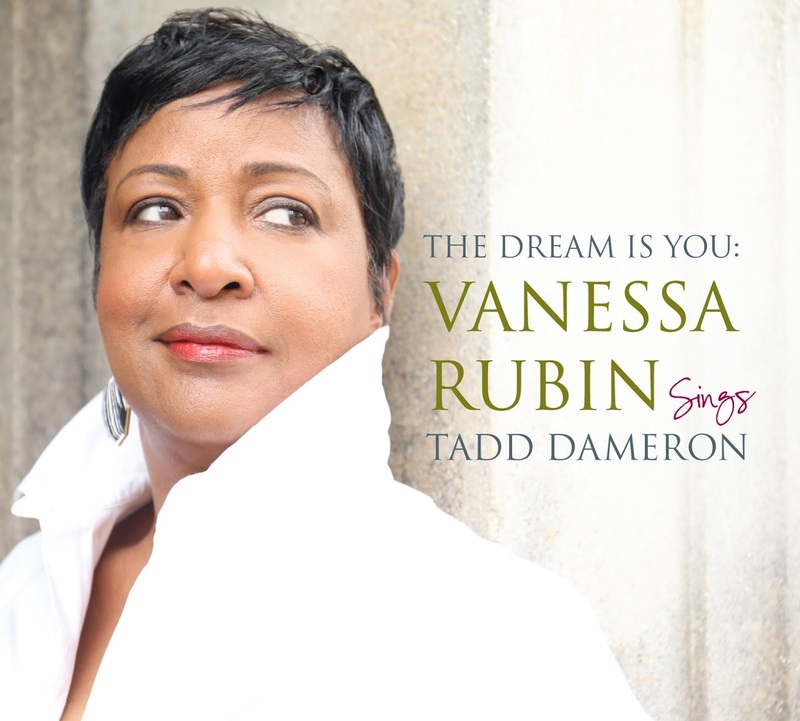 Jazz Station - Arnaldo DeSouteiro's Blog (Jazz, Bossa & Beyond): Vocal Jazz CD of the Month - "Vanessa Rubin Sings Tadd Dameron / The Dream Is You"
Vocal Jazz CD of the Month - "Vanessa Rubin Sings Tadd Dameron / The Dream Is You"
For her first solo project in years, Vanessa Rubin turns her attention to the influential pianist, arranger and composer Tadd Dameron. A fellow Clevelander, Dameron was one of the most revered and distinctive voices in bebop who is often overlooked. With the release of "The Dream Is You," the acclaimed vocalist hopes to change that perception and shine a light on one of the most important voices in jazz history. "The Dream Is You" is the first all-vocal recording of Dameron’s music! For this momentous occasion, Rubin assembled an impressive band of jazz luminaries including pianist John Cowherd, bassist Kenny Davis and drummer Carl Allen with trumpeter Eddie Allen, tenor saxophonist Patience Higgins, alto saxophonist Bruce Williams, trombonist Clifton Anderson and baritone saxophonist Alex Harding. Dameron contemporaries Jimmy Heath, Benny Golson, Frank Foster and Willie Smith, along with Bobby Watson, contributed the ingenious arrangements. Tadd Dameron was one of the most influential musicians of his generation. Well ahead of the curve in the developments in jazz in the 1940s and 1950s, he was a friend and colleague of Kenny Clarke, Dizzy Gillespie and Charlie Parker, and was involved in the formation of the ground-breaking Billy Eckstine Orchestra. His work in the 1940s anticipated developments in jazz in the late 1950s and 1960s. He was also a mentor to many musicians, including Miles Davis, Benny Golson, Billy Paul, Charlie Rouse, and Sarah Vaughan. Having spent 25 years of her career including Dameron’s music in her touring repertoire, the songstress and storyteller is profoundly interpretive with each lyric on this recording- she tells the story of Tadd Dameron and what he means not only to her, but to the art of jazz. Rubin devoted significant time to unveiling the vast array of Dameron’s vocal catalog. She sought the help of institutions like The Institute of Jazz Studies at Rutgers University in Newark, NJ, Juilliard School of Music and Lincoln Center in NYC, researched at The Library of Congress in Washington, D.C. and drew from both his autobiographies. In addition to consulting with her arrangers, veteran musicians knowledgeable of Tadd and his music were also very insightful. Notable were music publisher and trumpeter Don Sickler, author and tenor player Paul Combs, bassist Bill Lee, alto player Willie Smith from Cleveland and former jazz radio host and drummer Kenny Washington. “I discovered rare gems and was inspired by Tadd’s uncanny ability to write a beautiful melody and wrote words to one of his tunes that had no lyric,” said Vanessa. Each of the arrangements heard on "The Dream is You" were especially commissioned for this project. Benny Golson, who penned both forwards in two books about Tadd, also scored the “If You Could See Me Now”, and considered his time riding in Tadd’s car when they were working with “Bull Moose” Jackson his “graduate school”. “Lady Bird”, “Weekend” and “You’re A Joy” were arranged by Frank Foster, who learned the essentials of arranging by listening to Tadd’s recordings from the late 1940s. Jimmy Heath spent time discussing music with Tadd when he would visit with their mutual friend Doc West. He scored “On A Misty Night”, and we also enjoy the clever lyric of Georgie Fame on the haunting gem “Whatever Possess’d Me” (previously "sung" by tenor sax master Stanley Turrentine), “I Think I’ll Go Away”, and “Reveries Do Come True”, a/k/a “The Dream Is You”. Tadd’s classic “Good Bait” was arranged by Willie “Face” Smith, an old Cleveland friend and colleague who was perhaps the closest to Tadd. The fifth arranger, Bobby Watson, despite coming on the scene after Dameron had passed, provides a lyrical chart of “Never Been In Love” that fits beautifully with the others. Seven of the songs presented here have lyrics as intended. The other five have had lyrics added, and in all but one case the original titles give the lyricist a strong suggestion to go by. Included in this second group is Vanessa’s lyric for “The Dream Is You”, which Tadd wrote for a Milt Jackson album, and Vanessa retitled “Reveries Do Come True”. Her title and lyric for this beautiful melody expresses her vision of expanding the vocal library for singers by highlighting Tadd’s music, and hoping for greater awareness of this great American musician’s contribution to our rich musical heritage. Vanessa Rubin first took the world by storm with "Soul Eyes," her 1992 debut for Novus/RCA Records. Vanessa’s output for RCA in the 1990’s was outstanding; she released four more albums for the label including "Pastiche" (1993), her Carmen McRae tribute "I’m Glad There Is You" (1994), "Vanessa Rubin Sings" (1995) and "New Horizons" (1997). She subsequently released two more albums on Telarc: "Language of Love" (1999) and "Girl Talk" (2001). Over the next decade, Rubin maintained an active touring schedule and her live shows garnered major accolades. She ventured into acting with her well-received one woman show “Yesterdays: An Evening With Billie Holiday”, written by Renee Upchurch and directed by Mr. Woodie King Jr. In 2011, she was nominated for a Kevin Klein Award for Outstanding Lead Actress in a Musical. Two years later, Vanessa teamed up with renowned saxophonist Don Braden for "Full Circle," released on Braden’s label Creative Perspective Music. Vanessa Rubin is thrilled to present this deeply personal and historically significant project to the world. “I have been walking with Tadd for many years. And he never let me go,” she said. So many years in the making, "The Dream Is You" is a landmark recording for Rubin and solidifies her standing as one of the great jazz vocalists of our time. Let's wait for a Grammy! Kenner will release his debut album, "8Ball City"